We’ve seen quite an explosion of new gear over the past few years that serve the effects pedal market. Pedalboards are getting larger and larger (some seem to weigh as much as the racks they aim to replace), making it more important than ever to preserve your tone as it passes through multiple effects. And in the absence of a MIDI foot controller, we need fast and easy ways to control those pedals without a major tap dance performance on every song. Audio loop switchers provide the perfect solution, combining audio loops, amplifier control, and memory to save presets for single-button amp and effect selection. The RJM Mastermind PBC audio loop switcher is one of the finest such products on the market, a tour-worthy product with unparalleled ease of operation. For players building a pedalboard to use in place of their larger rack-based rigs, imagine combining the essential elements of RJM’s Effect Gizmo, Tone Saver, Switch Gizmo, Mini Line Mixer, and Y-Not into one compact solution. What is is that sets this switcher apart from the pack? The Mastermind PBC contains audio loops for front-of-amp and in-the-effects-loop placement, amp function switching, a line mixer, full MIDI capabilities to control your more sophisticated pedals, and a computer-based editor that makes it a breeze to create presets and build song lists and set lists. Taking time to really explore your specific needs and programming options will take some time—the capabilities here run deep, but at the end of the day, you won’t be left saying “If it only did…,” or wishing for anything more. It's one bag of tricks that can really deliver on all of your switching dreams. It’s so dreamy, in fact, that multiple people on our staff are incorporating these into rigs right now. The RJM Mastermind PBC audio loop switcher is one jam-packed box with features and controls leaving no stone unturned. If you’re familiar with the rack mount RJM Rack Gizmo audio loop and function switcher (reviewed here), you’ll find the Mastermind PBC to be very similar, only in a floor/pedalboard version and with some additional features. 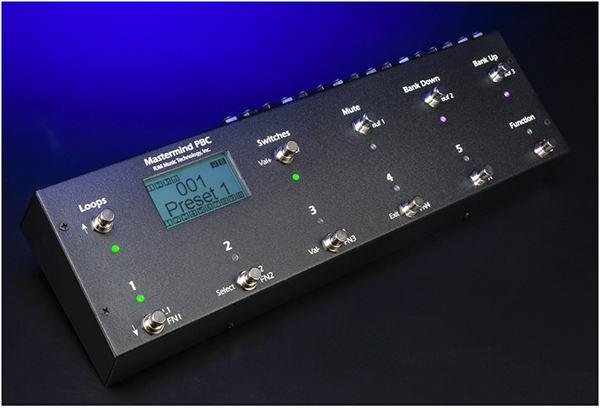 The Mastermind PBC is controlled via eleven multi-function footswitches (with assignable, multi-colored LEDs), features a large LCD display, and has memory for 640 Presets (five presets per bank). Two ¼” TRS jacks providing four external switch controls for operating your multi-channel guitar amplifier, while an additional, assignable external switch input is capable of adding two additional switches to your setup. There’s also an external expression pedal jack, MIDI In/Out for controlling your advanced effects products, a USB port for connection to a computer (to run the device Editor software), a second USB port for thumb drive-based device backup/restore/updates, as well as a Mute button which engages the internal tuner. The overall measurement of the unit is (w) 17.5” x (d) 5.5” x (h) 3.33” and weighs in at about 4 lbs. It will take up a decent chunk of real estate on your pedalboard. The Mastermind PBC provides a total of ten audio loops, which are arranged as follows: a group of four loops in series, an insert point, a group of two loops in series, an insert point, and another group of four loops in series (selectable). This is so that you don’t have to use short jumpers between every loop, and they are conveniently separated so that you can run some effects in front of your amp and others in the effects loop. Further, the last four loops are stereo compatible when used with ¼” TRS stereo patch cables. But why stop there? The last four loops can be switched between Series and Parallel signal routing courtesy of an internal line mixer! The A & B Output jacks serve as either a left and right stereo output or as a pair of mono outputs providing A/B/Y switching between two separate amplifiers. Output B also has a switchable isolation transformer and programmable phase switch. Also included in the PCB is RJM Music Technology’s Click Stopper technology. Because relays are used for switching loops in and out of the signal path — optimal for an overall low-noise design, switching some pedals in and out might generate unwanted pops or clicks, though how noticeable these pops can be will vary based on your pedals and your amp. The Click Stopper technology mutes the individual loop output quickly during the switching process to remove the offending noise, and it’s recommended for use with the effects running into the front end of your amp (not your effects loop). Although full customization and editing can be accomplished on the floor, editing software is available for Macintosh and Windows PCs that provides an easier interface to configure the device and your set lists. Set lists, you ask? Similar to the RJM MasterMind GT MIDI foot controller (reviewed here), you can name your presets, then arrange those presets in the PCB in specific set list order, and easily update the organization of your presets when preparing for a new gig, without having to create new effect presets. An AC power supply is included, but since it runs off of 9V (500mA) or 12V (400mA) DC, you shouldn’t have any problem powering it from your typical high-current pedalboard power supply. Our first task entailed making sure the Mastermind PBC had the most up-to-date firmware installed. Turning the unit on and viewing the firmware version on the boot-up screen was simple enough. We noticed on the RJM website that a new version had been released, and the update process was as simple as downloading the newly released firmware version to a USB flash drive and then uploading it into the PBC via the USB devise port. The process took just a few minutes: Enter Setup mode, select System Functions, select Update Firmware, insert the USB Drive into the Mastermind PBC, and select the firmware file to for download. We tested the Mastermind PBC using multiple effects pedals. Obviously, setup and connection takes a little planning and custom cabling for a nice and clean pedalboard. Word of caution: if this is your first experience incorporating an audio loop switcher into your rig, don’t overlook the expense of additional cables and connectors! For purposes of this review, we used our preferred custom cable kit from Planet Waves (reviewed here). In testing the multiple capabilities of the Mastermind PBC, we split the loops as follows: Loop group 1 thru 4 was routed to the front of our amp and contained a RMC Wah pedal, Keeley compressor, and JHS Stateline overdrive pedal. Loop group 7 thru10 was routed through the amp’s effects loop and contained a Strymon Mobius, Strymon Timeline, and Neunaber Wet Reverb pedal. Our guitar was connected via the In 1-4 input jack (front of chain). Simpler setups could be obtained by not separating the loops—meaning that if desired, you could have all the loops connected in sequence with one output going direct to the front of amp input. From an output configuration standpoint, there are few options including mono out via Output A/Left or Output B/Right, or you can use them both for a stereo signal application running to separate amplifiers. Or… you can use both outputs to facilitate an A/B/Y switch. Like most players, though, we kept things simple (somewhat) and just tested the pedal with a single amplifier. A final step in the connection setup process was related to MIDI. Our biggest complaint with many other loop switchers on the market is that they don’t provide the option to send MIDI control to other processors. In our setup, we wanted to make use of MIDI to select presets in our Strymon Mobius and Eventide Timeline when selecting a specific preset. The Mastermind PBC made it all possible by sending MIDI commands via the MIDI Out on the PBC to the MIDI In of the Mobius, then MIDI Thru from the Mobius to the MIDI In of the Timeline. It’s a beautiful thing, how well this worked! 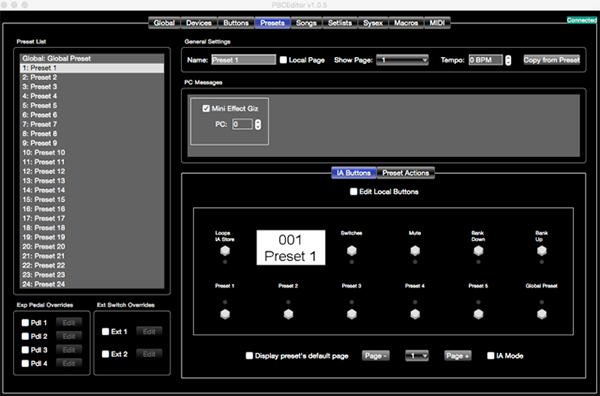 Setup of MIDI communication was quite simple: by entering the Setup menu and going to Edit Devices, all you have to do is select the device from a drop down menu and the PBC does the rest. 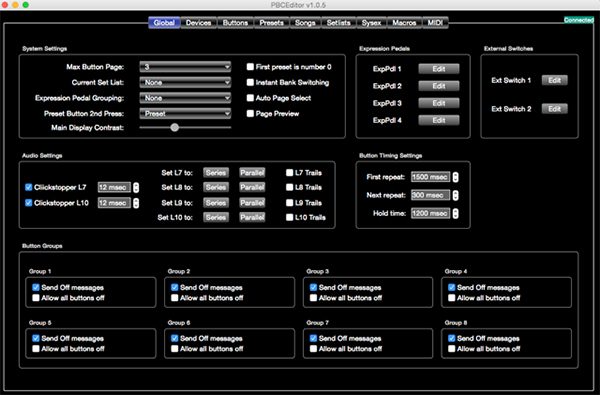 Alternately, using the software editor makes all setup/configuration tasks even easier and more comprehensive. If, by chance, the PBC does not have your specific device listed, you still have the ability to manually set it up. Since we were using a Mesa/Boogie Lone Star amp during this test, this provided the perfect opportunity to use the function switches to operate the amp’s channel switching and Solo Boost feature. Like Mesa’s footswitch, the PBC can use a ¼” TRS cable for operating two-button foot pedals or use a standard ¼” cable for single-button switching. Depending on how your amp’s switch jacks are wired, you can set the function switch to invert the switching from On/Off to Off/On as needed. Once you’ve completed the initial setup, you can program each preset in the PBC to select the desired function switch (amp channel) and solo boost setting. There are additional options for splitting out the function controls depending on your specific amplifier configurations, too, such as changing settings on two amps. Rest assured, with up to six function switch options, you should be covered for most scenarios. Two additional features came in very handy in final tweaking of the performance and tone output from the Mastermind PBC. No matter how minor, it can very annoying to have your tone affected by either auditable footswitch clicks or loss of high-end tone and clarity due to extended signal paths. The Mastermind PBC provides a solution to both issues via a Click Stopper function and the ability to insert audio buffers in the signal path. The Mastermind PBC provides three audio buffers: one in front of Loop 1, one before loop 7, and one after Loop 10. By default, these loops are on, but can be turned off where needed. 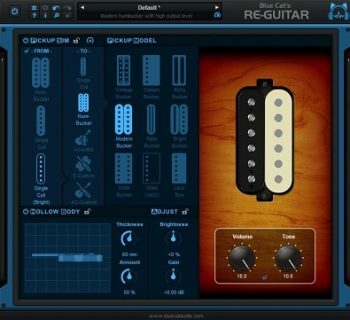 The buffers help strengthen and preserve the guitar’s tone as it passes through the system. In our set-up, we chose to turn off the audio buffer in Loop 1 (pedals in front of our amp) because some effects could be affected in an unfavorable manner. In our case, we had a wah pedal that tends to not function well with a buffer in front of it. You’ll need to experiment and see what best works with your setup, but having three buffer options at different insert points provides excellent usability. The Mastermind PBC uses relays to perform its switching. Though they are the most preferred switching method, they can cause auditable clicks during operation. To compensate for this issue, the Click Stopper circuitry will actually mute the signal path for a brief moment while the relay switching occurs. The Click Stopper circuitry is part of the second and third audio buffers. The Setup Menu contains a very comprehensive listing of all available programming options within the Mastermind PBC. Fair warning—it’s quite extensive and provides a long list of options. But, that’s what one would expect from a switcher of this caliber. Though navigating through the onboard menu/screen is very comprehensive, connecting the PBC to our computer via USB and using the online editor was definitely preferred. After all of the configuration is said and done, one very cool feature of the Mastermind PBC is its ability to setup Song Lists and Set Lists – an excellent tool for live performance. Presets can be assigned to a particular song and arranged in performance order. Once the songs are programmed, you have the ability to assign them to Set Lists (banks of Songs.) By recalling a desired Set List, all you need to do is toggle up/down to navigate from song to song, with each of that song’s presets ready to go. It doesn’t get any easier than that. Custom names on the large display helped keep everything straight. The internal line mixer is another great feature. This enabled us to ensure that delay and reverb tails weren’t cut off after disengaging associated audio loops. In our big rigs, we rely upon the RJM Mini Line Mixer (reviewed here) to accomplish this task, so haven’t the functionality built into the floor-based PBC is fantastic. Tuner and Mute functions worked well. When we engaged the Mute footswitch, the tuner function activated, changing the LED screen to display our note name and under/over pitch indicators (arrows). There was also a useful indicator bar at the bottom of the screen that grew in length from center towards the sharp or flat side of our note depending on how far out of tune we were. As with their other products, we found the RJM Mastermind PBC audio loop switcher delivered excellent sound quality. With any use of multiple effects pedals and long cable connections reaching pedal boards placed twenty feet or more away from the actual amplifier, there is always the risk of tone loss and electrical noise. The Mastermind PBC takes all sound interferences into consideration and provides solutions within the unit to add audio buffers, isolation transformers and a Click Stopper noise reduction circuit to ensure excellent tone support. From our experience, we can attest to far better pedal sound quality using the Mastermind PBC than the alternative: one or two long, continuous chains of pedals. RJM have succeeded in delivering the quality of their big-rig, rack mounted loopers, switchers, and mixers in a compact solution that you can place directly on your pedalboard. By the time you read this review, we will have already purchased a few of these for permanent use in our pedalboards. 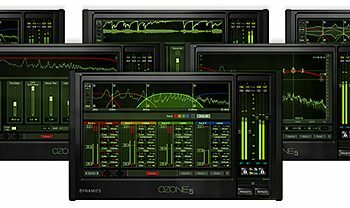 RJM Music Technology provides excellent documentation in the User’s Manual. Multiple connection setups are illustrated, and all features and functions are clearly explained. In addition, the RJM website provides additional resources including tutorial videos, firmware updates, blogs, and user community forums. The Mastermind PBC audio loop switcher sells for $999. 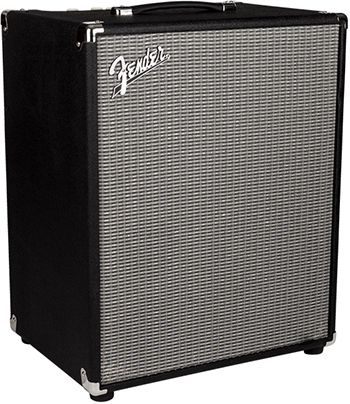 This is a good price for such a feature-rich, American made, tour-ready, loop/switch device.